This is top of the list. The first thing you should look for when hiring a plumber is whether or not they have a license, and are qualified. Being licensed means that the person is registered with the city, or local governing body. Many plumbers operate without a license, so make sure that the person who’s working for you on a plumbing job is licensed. Most professional plumbers offer free estimates to their customers, and they will come on site to check out the job before they work. Once your prospective plumber has had a chance to look over the job and provides you with an estimate, ask if what he has quoted includes materials, labour and a contingency for any problems. Ask the plumber if this is the total cost, because in many cases the cost given at this stage is merely the basic cost of materials which could potentially rise as the plumbing project goes on. 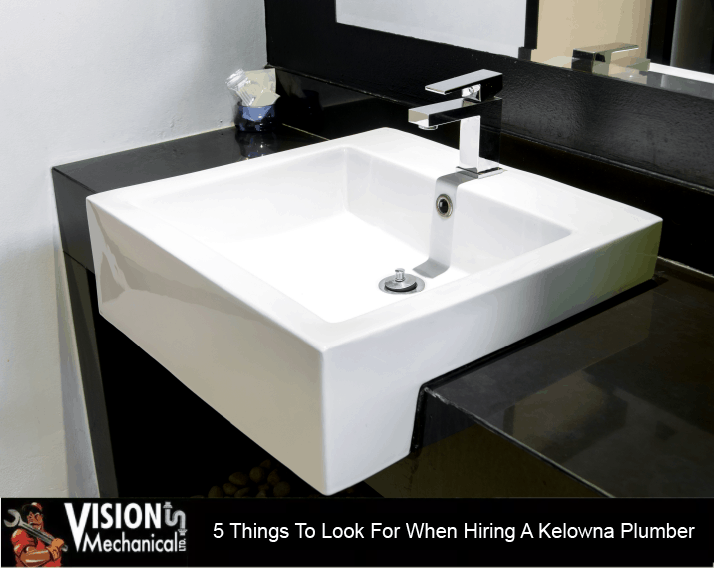 Most Kelowna plumbers will include a clause in the contract that homeowners will bear any reasonable costs to complete the job. Now here’s the thing you have to look for. Confirm ahead of time whether this quote is a flat rate, or an hourly rate plus cost of materials. The problem with the latter arises in the event the job runs longer than anticipated. 4 – When Do They Want Payment? This is the next thing you need to look for. Always ask when the plumber expects to be paid, and how much of the total cost he wants upfront. If your potential plumber asks for 100 percent of the cost before the job starts, this is unreasonable. So walk away. Some will use systems in which they are paid a small percentage when a certain percentage of the work is finished. Before signing anything, ask what kind of guarantee or warranty comes with the work of the plumber. Some might come back within the duration of a year to check up and fix any problems that may have arisen. Some will offer service on certain fixtures or under certain conditions if a leak occurs. Make sure all this is sorted out, set in writing and that the contractor is bonded and insured. Contact Vision Mechanical for all your plumbing needs and ensure the professionals take care of the job at hand. Your Trusted Kelowna Plumbing & HVAC Company. Copyright 2018 Vision Mechanical Ltd., All Rights Reserved.